The humiliation and frustration ran through the veins of every Evertonian, as referee Michael Oliver called time on another embarrassing night in the FA Cup for Everton Football Club, a crushing defeat that was showcased to the whole world. This was a horror story not even Stephen King himself would dare to pen with the locals baying for blood and their anticipation of the scalp of a Premier League club so great they turned out in their numbers, they became loud, intimidating and the cowardice of the visiting players was alarming. The media will paint a picture of FA Cup magic, a David slaying Goliath, they’ll pin point a cold, wet and blustery night in South London, but the reality is Everton just didn’t fancy this tie and Millwall sensed that fear, despite going behind twice, Neil Harris’ men didn’t relent but there can be no excuses for the a defeat of this calibre when you lead twice against a team struggling to retain their status in the Championship. On paper it seemed just the tonic, the perfect remedy to heal the wounds inflicted by a shocking run of results that now see Everton sit eleventh in the Premier League table. We all knew when we finally saw the end of Ronald Koeman and Steve Walsh it would take a long time to fix the mess they left behind, the first two men to get their hands on Moshiri’s millions they ran amok with the cash and with it came some horrendous decisions. They set about rebuilding Everton by throwing millions at average players by handing them eye watering contracts, leaving a wage bill to rival any Club across Europe with disastrous consequences but these same players must have the will to win and the desire to overcome the physicality of Millwall, the ferocious local support and accept that football is played in wet and windy conditions on poor pitches, Everton had nor the will nor the desire. To his credit Marco Silva picked the team we would have all selected, he went with a team stronger than Lincoln in round 3 which could be an indication that the pressure is starting to build, privately if not publicly. Dominic Calvert-Lewin was back to lead the line and Richarlison pushed to his more natural position out wide, but the in the result was the same, all too often have Evertonians felt this humiliation at the hands of inferior opposition. Fingers will, inevitably, be pointed at the manager as his stock continues to decline, the Goodison Park atmosphere is turning sour, a loss which compounds Everton’s season into another of mediocrity and missed opportunities but Silva gave his players the platform to play and to perform, to progress to later stages of the FA Cup to go in search of a trophy and to make themselves heroes to the Evertonian faithful but they let him down, yet again. Inability to clear the ball, cheap foul after cheap foul given away as the basics of defending, remarkably, lost on a group of international footballers. The manager can quite rightly point his own finger in the direction of the officials, Michael Oliver’s decision to hand Millwall a second equaliser after a clear handball by Jake Cooper was outrageous, Silva can also bemoan the lack of VAR at this televised tie, while still in its infancy the video replays are only being used on a trial basis at Premier League stadia, had it been disallowed then Everton would rightly have remained 2-1 in front and on track for their win but as it was Millwall had a foothold, it was the catalyst they needed to go on and progress into the fifth round at the expense of Everton but Silva should also be pointing fingers at his own players, they massively underperformed and they let him down when he was in desperate need of a performance and the relief of a win, the very last thing he needed was another humiliating loss on his record. 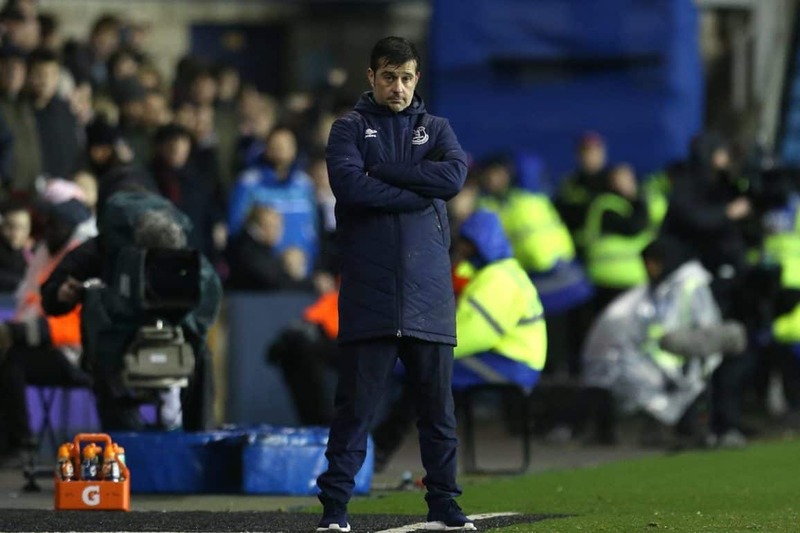 Silva has his faults, his desire to continually playing Richarlison as a striker, while he keeps Cenk Tosun and Dominic Calvert-Lewin on the bench is baffling, continually changing his defence and his formation cannot be helping but there are players within this squad that have now underperformed to the detriment of three managers during the Moshiri era, the stubbornness to play a certain but unsuccessful style has now cost Roberto Martinez, Ronald Koeman and Sam Allardyce their jobs, something that will not be lost on Silva, maybe this notion was the thinking behind a strong team selection, even with a trip to Huddersfield only a few days away. Gylfi Sigurdsson, brought in for almost £50m, with the expectation of being the creative number 10 Everton have been crying out for, the man to drive the Club forward on the pitch with the potential to thrive at the top end of the Everton midfield, a player who could pull off a little bit of magic to drag results out of nothing. The reality couldn’t be much the opposite, consistently lacklustre and anonymous performances show this was more money wasted as Everton tried a major rebuild, he isn’t alone, the fact that most of the players signed during Koeman and Walsh’s reign have departed, mainly on loan, but out the door all the same tells its own story. There has been a wait of 24 years for a trophy to be brought home to Goodison and that wait will now continue into its twenty-fifth year, barring the odd flirtation with the FA Cup and a semi final appearance in the League Cup, opportunities have been limited and many years have just gone by without a second glance. As the top six continue to strengthen and grip the few trophies on offer it becomes tougher by the season for a Club like Everton to end their drought. Moshiri’s purse strings may tighten until the wage bill and squad size is reduced but the owner and fans must back the manager, too many have come and gone in the last few years, nothing is gained over night and we must have patience with the current regime.